Home / Anas Aremeyaw Anas / Gyamfi's Column / Kwaku Baako / AREMEYAW ANAS DENIED BY THE BBC? BAAKO LIED AGAIN? 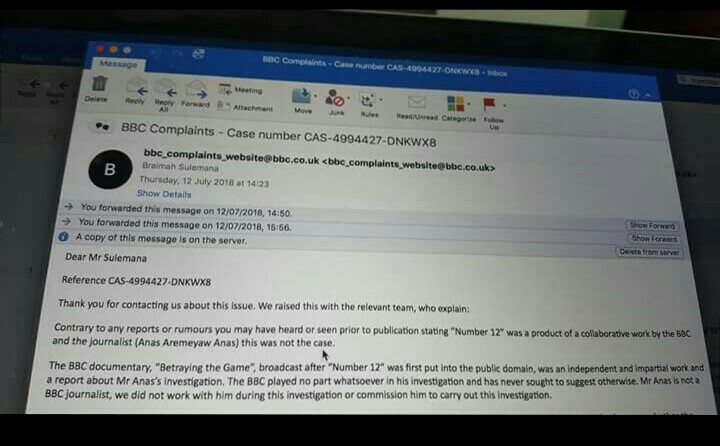 AREMEYAW ANAS DENIED BY THE BBC? BAAKO LIED AGAIN? 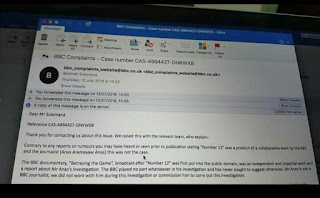 Gyamfi's Column has intercepted a communication between the Executive Director of the Media Foundation for West Africa and the BBC which suggests that BBC had no direct hand in Anas Aremeyaw Anas' exposé dubbed "Number 12". The exposé which was aired on major local TV stations sought to expose the rot in the local football circles. The then President of the football association, Mr. Nyantakyi and some executives were seen on tape going contrary to the laws of their jobs. Some referees were also exposed. This earned the ace journalist some accolades. However, the Editor-in-chief of the New Crusading Guide claimed that the renowned work was done by his mentee in collaboration with the BBC and some other international partners. Mr. Baako asserted the work which was shown across the length and width of the nation on the 6th of June was a joint project between Tiger Eye Pi and BBC on Peace FM's Kokrokoo show on 30th May 2018. Doubts have been placed on the credibility of the ace journalist and his team after the Salis Newspaper also screened a film of the journalist negotiatioing with some culprits of a case he was investigating. In the said video, he took money from the culprits to quash the case. The exposé, the last by the investigative journalist, saw a halt being placed on football activities. The culprits in the video have also sought to redeem their dented images in the law court. The BBC's statement casts further doubts on the credibility of the Tiger Eye crew. According to the BBC, they had no knowledge of the Number 12 video and did not sanction it as reports had suggested earlier on. They claim to have only wrote a report documentary, "betraying the game" which is an independent and impartial report on the ace journalist's work. They added succinctly that they did not sanction or sponsor it.